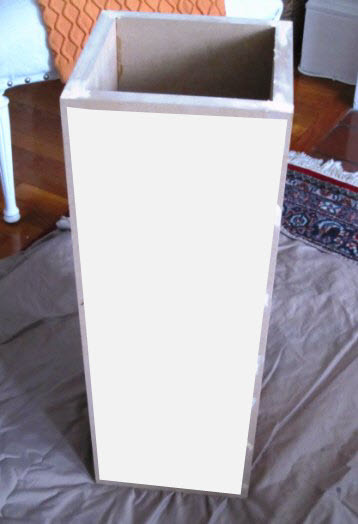 I finally got a few coats of primer and Ben Moore's White Dove on my umbrella stand, now all that's left to do is figure out what pattern / border / design to embellish it with. Oh the choices! a chevron pattern like my orange tray? I already have the orange paint too! 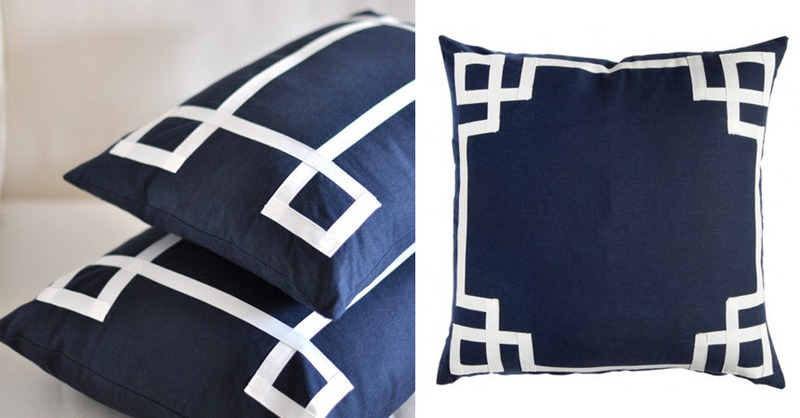 I am completely smitten with Caitlin Wilson's new fabric and pillow line, aptly named Caitlin Wilson Textiles. 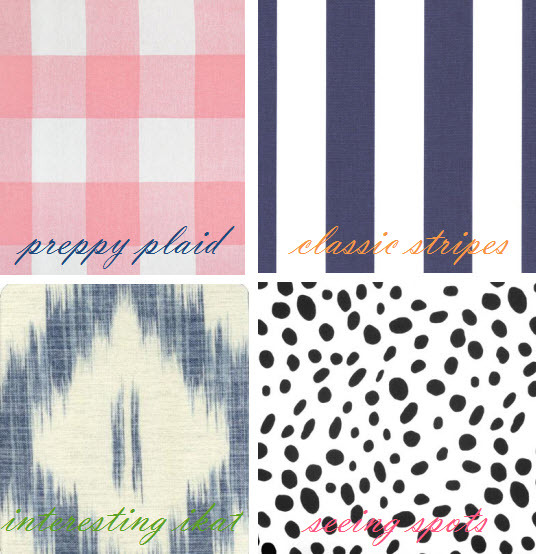 She put together an amazing collection of fabrics and pillows and they all coordinate! Making it super user friendly and almost impossible NOT to put together an amazing design using them. Anywoo- her Deco and Signature pillows are the inspiration for a possible design. Can't forget Jenny's famous monogram stand- LOVE hers and a project with my new monogram would be lovely! Nailhead trim is always fun! Since I'm on a gold kick I would have to order some new gold nailheads and go to town with a fun design like this one. Fabric patterns are always a big source of inspiration for me and these fabrics would make pretty designs for my umbrella stand. The ikat fabric is actually what I used for my new kitchen window treatment, so repeating the pattern in my hall could be a nice way to tie the two spaces together. See my dilemma- there are so many choices! I must pick one before this weekend so I can get started on finishing this thing- its been sitting in my hall unfinished for fall too long and that has to end now! Love the dalmation! I just got some pillows made in that fabric! The bright chevrons would be a great bold piece, but I'm so drawn to the classic monogrammed one too! Good luck with the choices - all fabulous! 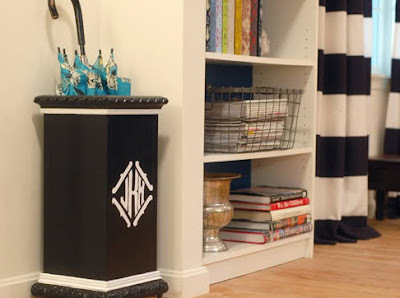 The monogram umbrella stand you featured is my favorite look...as well as the CW Textiles pillows! well I can only imagine how stunning this will turn up! I love the organge tray design - very zippy!! Oooh so many fab ideas!! I'm also favoring the classic monogram design (Caitlin's deco pattern is close second). I LOVE BM White Dove--it's the perfect soft white. Can't wait to see what you do!